The Bad Ax disc mulcher is a new addition to the Loftness line of vegetation management equipment. Though the winter months can pose additional challenges for railroads, vegetation management requires efforts year-round. This month, RT&S highlights the recent developments in brush fighting equipment and weed controlling herbicides, in addition to new tools being used to monitor vegetation. Customer-focused tools, modern chemical combinations and newly released attachments all help railroads meet their vegetation management goals. Corteva Agrisciences, formerly Dow AgroSciences, recently introduced its Freelexx® herbicide, said Damon Palmer, business leader, Pasture & Land Management, Corteva Agriscience™ Agriculture Division of DowDuPont. Palmer said the Freelexx® herbicide is built on new 2,4-D choline technology to deliver lower odor and volatility than traditional 2,4-D formulations. The company’s customers include all railroads and railroad applicators. Additionally, Corteva Agriscience™, the Agriculture Division of DowDuPont, offers several herbicides and technologies in the pipeline that Palmer said are promising for railroad vegetation management. “We are currently in the final stages of screening and testing these solutions — and are excited about their potential for this market,” he explained. Have customers been seeking anything specific to help with vegetation control? Do you mind letting us know who some of your primary customers include? Homer Deckard, railroad territory manager, Corteva Agriscience™, Agriculture Division of DowDuPont, said customers are currently seeking answers regarding how they can stretch a two-month or three-month vegetation control program to last six months or more. Deckard added that customers also frequently ask for help with specific recommendations on how to best control tough resistant weeds they are missing, such as marestail, kochia and pigweed. “We continue to promote herbicide rotation as a critical management technique in light of the well-documented issues with weed resistance this industry faces,” Deckard said. Deckard says the most important issue in the railroad vegetation control market remains resistance management. He explained that its impact continues to grow in significance as worn-out chemistries continue to be applied. Deckard said when applicable, the use of selective herbicides for rights-of-way vegetation management meets objectives such as keeping weeds and brush under control, while also helping create a habitat in which native plants and animals flourish. Deckard said more intelligent brush fighting techniques, such as chemical side-trimming, are intelligent alternatives to mechanical brush-cutting. The herbicide is only applied to the branches of the trees that pose a threat to the right-of-way, keeping the tree alive, healthy and more aesthetically pleasing, while removing only the problem area of the vegetation, he said. Corteva Agriscience continues to promote implementing the principles of an integrated vegetation management (IVM) strategy as a best practice, Deckard said. The strategy relies on various treatment methods and focuses on the selective use of herbicides to control incompatible vegetation. “IVM delivers the most effective control and brings a better return on investment than using straight mechanical methods,” Deckard said. As for market demand, Deckard said many in the industry have shifted their focus away from program efficacy in favor of reducing up-front costs when developing a vegetation management program. In the coming year, Palmer said the company looks forward to seeing the fruition of the 2017 merger of The Dow Chemical Company and DuPont, which created DowDuPont™. 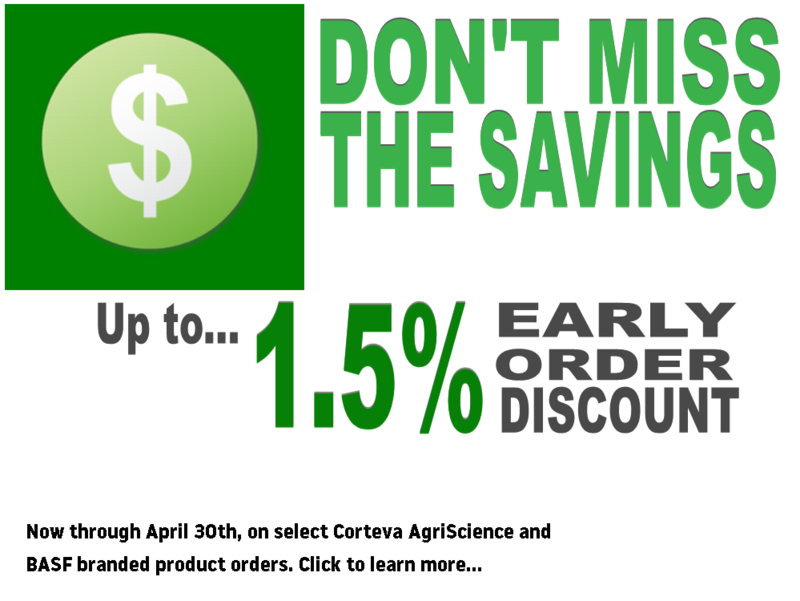 In June 2019, pending board approvals, a new, independent agriculture company will spin off and become Corteva Agriscience™. Jarraff Industries recently unveiled a new Jarraff All-Terrain Tree Trimmer with an updated design, new look, higher power output and improved efficiency, the company said. The updated Jarraff trimmer features a patent-pending rotating saw head design that the company said allows the operator to rotate the blade assembly by 180 degrees. A new touch screen information center is also featured to provide the operator with improved control, engine monitoring and a high-definition camera display. The new Jarraff features a Cummins 130 horsepower, Tier 4 engine that meets all environmental emission standards and mandates, the company said. The Jarraff All-Terrain Tree Trimmer also provides ROW maintenance contractors with a dynamic field of operation. A rotary manifold offers a 360-degree plus range of motion as a standard feature, and the unit also provides lateral tilt and 75-foot cutting height. Two four-way joysticks and fingertip controls offer optimal precision. In addition, Jarraff’s cab is completely ROPS, FOPS and OPS certified. Full panel, lexan windows prevent distortion and provide a clear view of operations. “The Jarraff adds safety to every job because workers never leave the ground,” the company said. Loftness recently introduced the new Bad Ax disc mulcher attachment for skid steers. The attachment features a fully-machined disc, dual recutter bars, bolt-on tooth mounts and many other unique features to improve performance and cut material into finer particles than competitive disc mulchers allow, said Bill Schafer, product development supervisor for Loftness. Loftness has also released new Battle Ax horizontal drum mulcher models for both skid steers and excavators. “The Battle Ax has a unique new rotor design with depth gauges to help optimize the amount of material being fed into the drum, no matter which type of cutting tooth is used,” Schafer said. The Battle Ax also features an exclusive two-stage cutting chamber for producing finer particle sizes than other units on the market. Loftness’ primary customers include vegetation management contractors who specialize in right-of-way maintenance, Schafer explained. Loftness also manufactures the Kwik-Trim compact mechanical tree trimmer, which can trim branches up to 53 feet high using a mini excavator chassis. 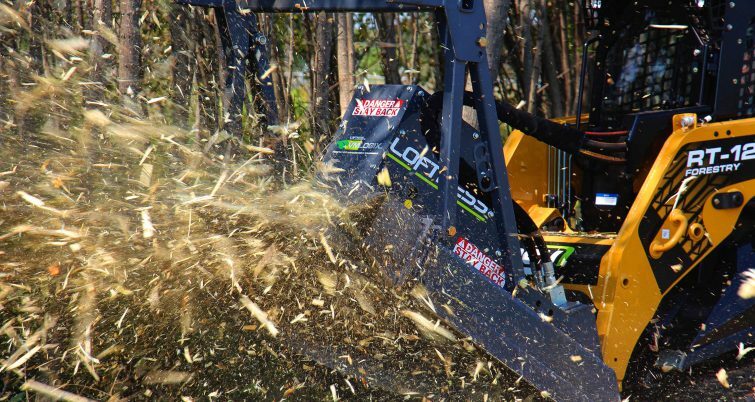 Loftness’ niche in the vegetation management industry is the development of compact equipment, which the company says is often more efficient and cost-effective than larger mulching and trimming equipment, while being able to access more areas. The company said vegetation management contractors are always looking for ways to address tight budgets. “Loftness anticipates a strong 2019 because of the large number of right-of-way miles that continue to require maintenance, no matter the economic or political environment,” Schafer said. Progress Rail recently introduced its Kershaw SkyTrim 75G3 tree trimmer, which the company notes is equipped with a U.S. EPA Tier 4 certified Cat® 4.4L engine. “This model was designed with an engine that meets today’s stringent emissions regulations, while still offering customers the power and performance that they need to accomplish their vegetation control projects,” Progress Rail said. The company said its Gen 3 Kershaw SkyTrim has been popular with customers and has a rotating head that offers 185-degrees of coverage. “This feature helps customers get into tight spots to trim trees more efficiently, offering more versatility,” Progress Rail said. Equipped with hydraulically-controlled rail wheels, Mackey said the machine can be prepared to propel down the rail track in a matter of minutes. The company serves a broad mix of utility contractors, co-ops, departments of transportation, state and county municipalities, Class 1s and shortline railroads. In a recent trend, Progress Rail said the company has observed changes to the market resulting from the unemployment rate having dropped in the United States. “We’ve witnessed increased challenges to find qualified labor, more vegetation management companies have been moving toward mechanization, thus creating further interest in our products,” the company said. The Progress Rail team continues to focus on listening to customers’ needs to build upon the company’s existing vegetation management product line, including its various SkyTrim models, and consider ways to enhance any current features or examine options for new additions, the company said. “Our goal is to ensure reliability, quality and performance remain top of mind. Our customers’ uptime is crucial and we take their feedback seriously,” Progress Rail said. Supertrak’s new release is a SK170MX, Industry First Tier 4 final dedicated Mulching Excavator. 170hp 4.4 T4F single engine, said Dave Evans marketing/sales manager for Supertrak. Evans said the machine has an industry-leading high flow / high pressure system for dedicated pumps, cooling and reversing fan systems that are needed for vegetation management. He explained that the company’s customers include those working in railroad ROW, pipeline ROW and powerline ROW, and more. An issue in the vegetation management field Evans said needs to be addressed is the necessity that customers ensure their equipment has adequate cooling for high ambient applications. In a more recent change to industry demand, Evans said emissions requirements have been driving change within the equipment world for several years. “New designed cooling systems, fuel systems and exhaust systems are an critical part of how well they will perform in the vegetation industry,” Evans said. He added that the company believes 2019 will bring a strong market demand for the vegetation industry, driving longer lead times from vendors.